8 Mimram Road, Eastbourne, East Sussex, BN24 5DZ. 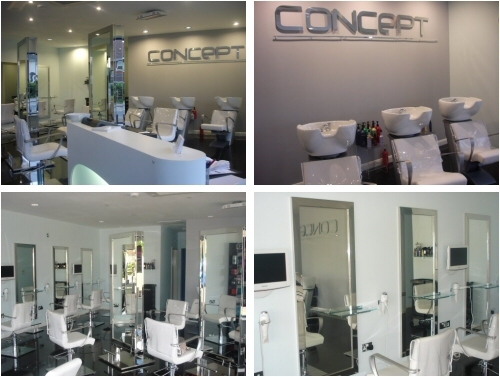 Concept Hairdressing was established in 2010 by Wayne Robertson and Jacqui Barker. A new ‘Concept of Hairdressing’ was the inspiration behind our salon. Searching for the best location to open our salon proved challenging and when a brand new shop, standing empty with no floor or plaster on the walls became available in Stone Cross, we knew we had found the perfect place for our Concept to become reality. Having lived in Stone Cross since 2005 and knowing that the area lacked a hairdressing service, we knew we could offer a great service in this area, we fought hard to ensure the shop became ours. After nine months of negotiating with the landlord and building company, we designed the layout, selected the decor, furniture and equipment. Work was started on the premises in February 2010 using Ellis Building contractors, a local well established building firm who provided a high standard of service, ensuring the salon met our expectations. Work was completed on 29th April 2010 and the business opened the same day! With a combination of over 40 years experience of the highest standards in all aspects of hairdressing, we strive to ensure relaxation and customer care are at the focal point of our ambitions. We are always looking for improvements to the service we offer and feedback is always welcome from our customers. We hope that you will like what we have achieved and that you have an enjoyable experience with us. The salon was designed by Wayne Robertson and Jacqui Barker. We knew we wanted to offer something that Eastbourne has not been able to offer until now. We wanted a fresh look with a contemporary feel, standing out from the rest. The environment we created has proven to be relaxing, clean, spacious and modern. Air conditioning, televisions, comfortable seating and the top range refreshments all add to the customers experience. We aim to provide you with the opportunity to enjoy the pampering you deserve. Albert Ewen drew our ideas in to a 3D drawing to scale with the actual units, chairs and basins we were buying. The excellent service provided by him saw him flying across the UK to ensure the smooth running of deliveries and to check the furniture was to the high standard we required. Providing Excellence…. Eastbourne’s Answer to Hairdressing. Website built by Trevor Pope. © 2019. Concept Hairdressing – Hairdressers in Eastbourne All rights reserved.